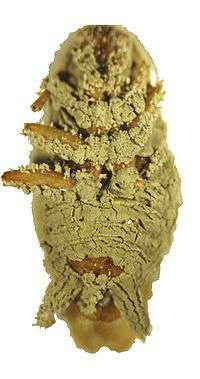 Metarhizium anisopliae, formerly known as Entomophthora anisopliae (basionym), is a fungus that grows naturally in soils throughout the world and causes disease in various insects by acting as a parasitoid. Ilya I. Mechnikov named it after the insect species it was originally isolated from: the beetle Anisoplia austriaca. It is a mitosporic fungus with asexual reproduction, which was formerly classified in the form class Hyphomycetes of the form phylum Deuteromycota (also often called Fungi Imperfecti). It has long been recognised that many isolates are specific, and they were assigned variety status, but they have now been assigned as new Metarhizium species, such as M. anisopliae, M. majus and M. acridum (which was M. anisopliae var. acridum and included the isolates used for locust control). Metarhizium taii was placed in M. anisopliae var. anisopliae, but has now been described as a synonym of M. guizhouense (see Metarhizium). The commercially important isolate M.a. 43 (a.k.a. F52, Met52, etc. ), which infects Coleoptera and other insect orders has now been assigned to Metarhizium brunneum. The disease caused by the fungus is sometimes called green muscardine disease because of the green colour of its spores. When these mitotic (asexual) spores (called conidia) of the fungus come into contact with the body of an insect host, they germinate and the hyphae that emerge penetrate the cuticle. The fungus then develops inside the body eventually killing the insect after a few days; this lethal effect is very likely aided by the production of insecticidal cyclic peptides (destruxins). The cuticle of the cadaver often becomes red. If the ambient humidity is high enough, a white mould then grows on the cadaver that soon turns green as spores are produced. Most insects living near the soil have evolved natural defenses against entomopathogenic fungi like M. anisopliae. This fungus is therefore locked in an evolutionary battle to overcome these defenses, which has led to a large number of isolates (or strains) that are adapted to certain groups of insects. The previously-described range of entomopathogenic fungus isolates known as M. anisopliae before 2009, had been observed to infect over 200 insect pest species. M. anisopliae and its related species are used as biological insecticides to control a number of pests such as termites, thrips, etc. and its use in the control of malaria-transmitting mosquitoes is under investigation. M. anisopliae does not appear to infect humans or other animals and is considered safe as an insecticide. The microscopic spores are typically sprayed on affected areas. A possible technique for malaria control is to coat mosquito nets or cotton sheets attached to the wall with them. In August 2007, a team of scientists at the Indian Institute of Chemical Technology discovered a more efficient way of producing biodiesel which uses lipase, an enzyme produced in significant quantities by Metarhizium anisopliae; as opposed to other reactions which use enzymes that require heat in order to become active, the reaction that uses lipase runs at room temperature. The fungus is now a candidate for mass production of the enzyme. M. anisopliae isolated from Dermolepida albohirtum (Coleoptera: Scarabaeidae) include: CSIRO FI-1358 (= ARSEF 7493) and FI 1045 which is the active ingredient of 'Biocane'. ↑ Bischoff J.F. ; Rehner S.A. Humber R.A. (2009). "A multilocus phylogeny of the Metarhizium anisopliae lineage". Mycologia. 101 (4): 512–530. doi:10.3852/07-202. PMID 19623931. ↑ GVP Reddy; Z Zhao; RA Humber (2014). "Laboratory and field efficacy of entomopathogenic fungi for the management of the sweet potato weevil, Cylas formicarius (Coleoptera: Brentidae)". Journal of Invertebrate Pathology. 122: 10–15. doi:10.1016/j.jip.2014.07.009. ↑ Cloyd, Raymond A. (1999). "The Entomopathogenic Fungus Metarhizium anisopliae". Midwest Biological Control News. VI (7). ↑ McNeil, Donald G. Jr. (10 June 2005). "Fungus Fatal to Mosquito May Aid Global War on Malaria". The New York Times. 104: 135–151.